Greetings everyone, I’m back once again to highlight the deckbuilding process through the use of Pyramid Theory. This time I discuss ‘all-in’ strategies, and the gambling it brings to the table. What do I exactly mean by ‘all-in’ strategies? All-in strategies are hyperlinear that accept the risks involved with only having one gameplan. Some commanders directly incentivize this kind of deckbuilding more than others such as Animar, Soul of Elements, Alesha, Who Smiles at Death, and Uril, the Miststalker. This article’s goal is to explore what makes or breaks an all-in deck, and illustrate how to create one that is fearless in the pursuit of victory. We will conquer this topic, as always, through the implementation of Pyramid Theory. For a more in-depth explanation of each step in the process be sure to check out my introduction to the topic here. For an all-in strategy our inspiration will likely be coming from a commander which has an insanely high power level. It’s possible to build an all-in strategy without this kind of commander; however, these decks are generally all about consistency, and having a general that facilitates consistency can be the key to a successful all-in strategy. 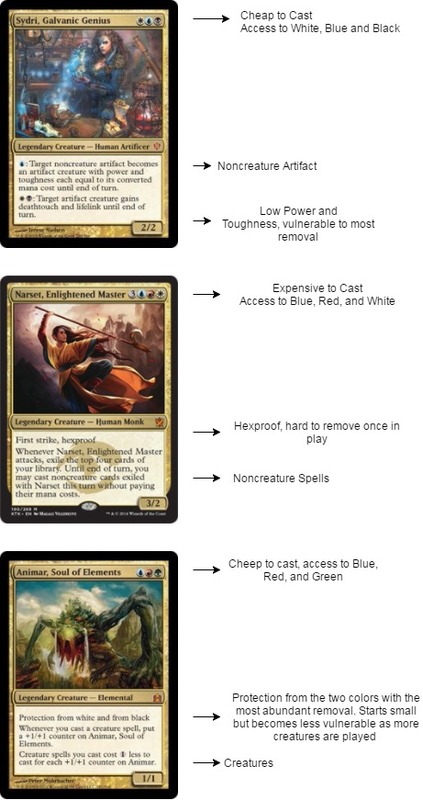 When looking for such a commander, I recommend looking at it’s mana cost, it’s ability to protect itself, and what you need in abundance to win. To better understand this concept let’s look at a few all-in commanders. All of these commanders can facilitate an all-in style deck. The mana cost gives you an idea of how the deck wants to develop its game plan, while also giving you some idea of the available tools that commander’s colors provide. A all-in commander that can protect itself can be indispensable, giving your glass cannon some much needed resiliency. The core aspect we want to evaluate is what specific strategy the commander wants you to go all-in on. All of these commanders can be built around in a variety of ways, but become more powerful the more devoted a deck is to their given strategy. For example Animar, Soul of Elements wants you to play as many creatures as possible. This can have its drawbacks, in that you can get blown out by mass creature removal spells such as Wrath of God. However, we are gambling with power, and we exchange the ability to have contingency plans for the power and consistency to overwhelm our opponents who can’t answer our game plan. I recently took some time to build my own all-in strategy. I was inspired to build a commander that was reliant on creatures and had some graveyard interaction. After some searching I found Grenzo, Dungeon Warden. Grenzo’s quirky ability allows us to cheat on the mana requirements of small creature while simultaneously filling our yard with other cards to recur later. He’s just what I’m looking for in an all-in strategy. An all-in build wants to take whatever our commander is doing and push it to its most extreme incarnation. This can even mean abandoning some of our guiding principles as deck builders. Let’s look at Grenzo as an example of how we can modify our deck construction parameters to accommodate an all-in strategy. We want to hit creatures a high percentage of the time whenever we activate Grenzo. This means we should be running an extremely high number of creatures compared to other decks. We need to keep this in mind throughout the deckbuilding process since any time we add a non-creature card we are taking away from the consistency of Grenzo’s ability. Many all-in generals have similar restrictions associated with their abilities. Our goal should be to accommodate for these restriction, and embrace them as move forward with deck construction. Like in our previous step we need to exploit our commanders abilities to their fullest. Here however is where we want to get into the nuts and bolts of what make the given all-in strategy powerful. 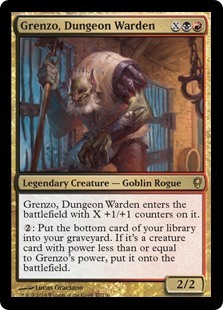 Grenzo, Dungeon Warden’s power really comes from having creatures that have a high converted mana cost to power ratio. The perfect example being Kiki-Jiki, Mirror Breaker. 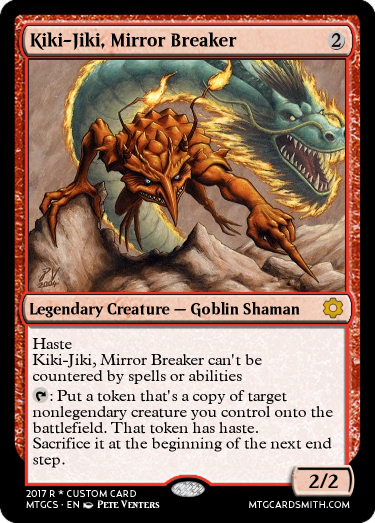 When Grenzo flips a card like Kiki-Jiki you are effectively paying two mana for an uncounterable Kiki-Jiki. We look to exploit this concept as much as possible. The other way to take massive advantage of Grenzo’s ability is to control the card on the bottom of our library with cards like Reito Lantern and Junktroller. 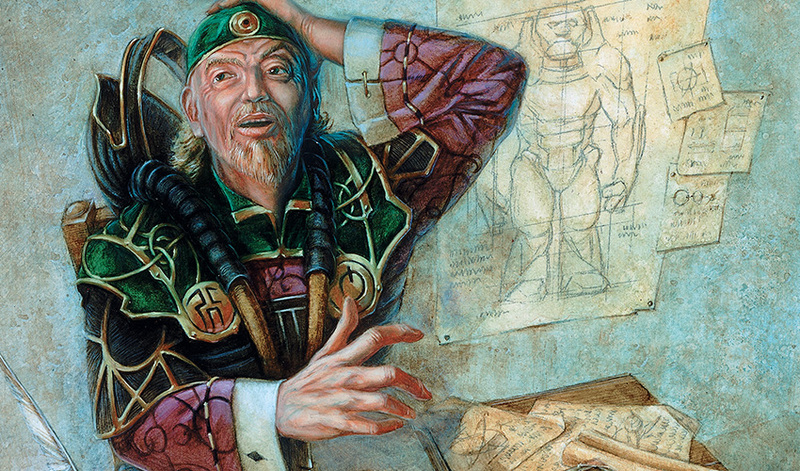 You will find many all-in commanders have a wide variety of tools available to them regardless of the strategy. This stage is where we normally start branching out and diversifying what the our deck does. We normally do this by going deep on each of our sub-themes and finding all the little micro synergies within the deck. Not that sub-themes are unimportant in all-in decks, but they are functionally less important than normal. Essentially we don’t want to diverge too far from our main gameplan. However I’ll highlight some of my build’s fun micro synergies. While Grenzo is generally good at getting a lot of creatures we want into play, he also has a habit of trashing cards we may have wanted at some point. I felt it was necessary to have ways to dig up artifacts, lands, and big creatures that Grenzo tosses into the graveyard. I found Goblin Welder to be indispensable in the deck, so much so that I dedicated a few slots in the deck just to facilitate his ability. 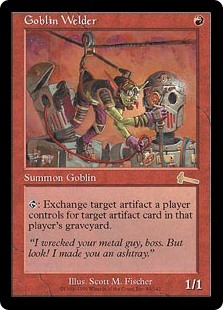 Both Moxen and the artifact lands are incredibly versatile when used in conjunction with Goblin Welder. They can be upgraded to larger mana rocks such as Thran Dynamo, while also recurring valuable artifact creatures like Noxious Gearhulk. For most all-in strategies the win conditions are fairly apparent from the outset. However some win conditions only emerge as you get deeper into the deckbuilding process. For example, on the surface it may appear that Grenzo would win by swarming the board with creatures and beating down. While this certainly is a valid strategy for Grenzo, I found through testing that cards like Zulaport Cutthroat won me more games than attacking. As such I tried to find more win conditions that weren’t combat-based. It’s hard to know at first what a deck’s most effective win condition is until you play a few games. Nonetheless, we should strive establish our win conditions during this point in the deckbuilding process. During the filling in the gaps step we normally focus on interactive elements. While we may be building an all-in deck, this doesn’t necessarily mean it has to be devoid of answers. We want to find interaction that fits within our decks goals and alternatives to the more commonly played interactive spells. For example, in a creature-based strategy you may want answers to problematic creatures, or even be able to counter spells. It is common to find cards with your given strategy that mimic the effect of powerful spells. 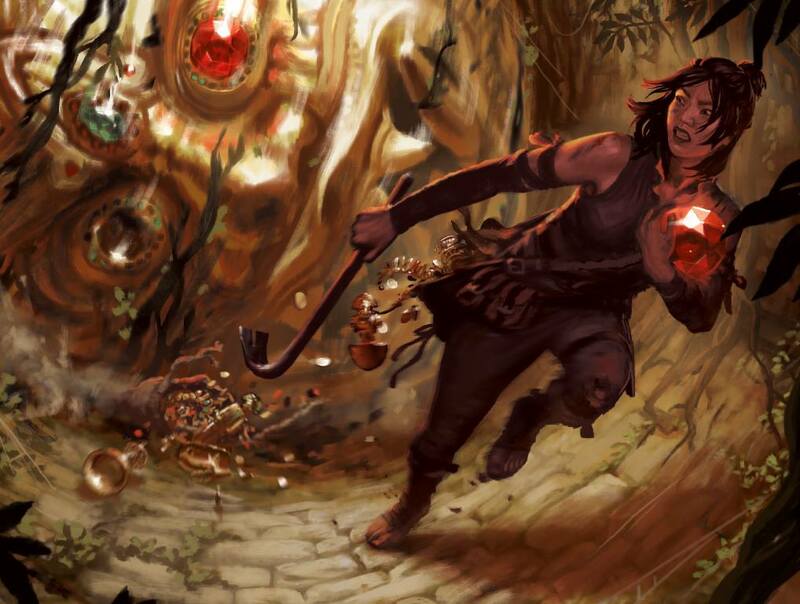 Here are some examples of powerful spells and their creature equivalents. It’s important to find cards such as these to fill the gaps in your given strategy and ensure your deck is well-rounded while staying true to your goals. Mana bases vary from deck to deck, and all-in strategies are no different. For more detailed instructions on mana base construction be sure to read my full explanation of the topic in my first article here. As always the deck building process is continuous. We want to be fearless in our analysis of our decks and be willing to improve on what isn’t working. I actually have this Grenzo deck in paper, and it has seen some vast changes over time. I found that, over time, the deck has become more all-in, more powerful, and fun as a result. Don’t be afraid to gamble with power, and never be afraid to go all-in. I hope you all found this instalment of Pyramid Theory 101 interesting, and useful. Feel free to reach out to me if you have any questions.